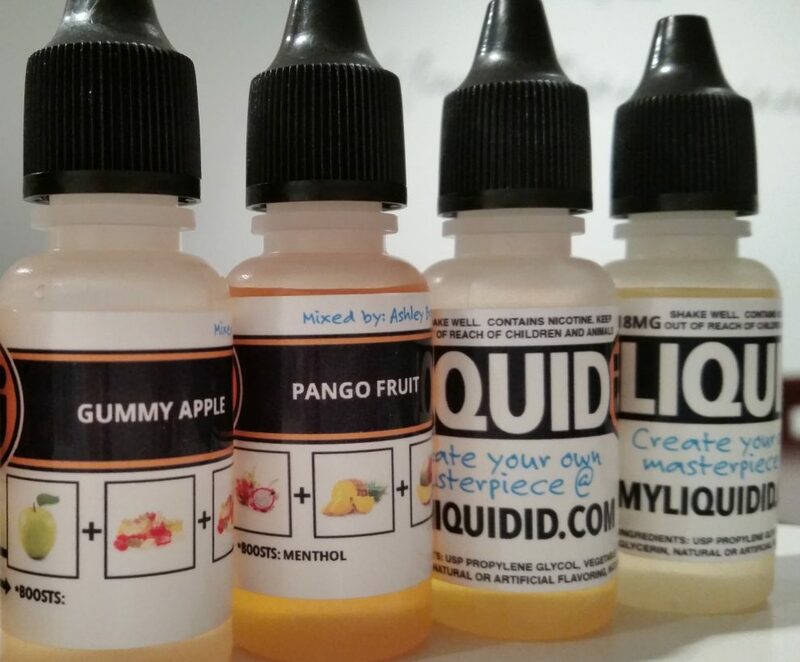 Liquid iD is a website designed to allow vapers to fully customize e-liquid to their own preference. By visiting the MyLiquidiD store, vapers can choose from over 40 different flavors and invent their own unique combinations to truly suit their own tastes. In addition, customers can earn rewards and show off their e-liquid mixing skills by sharing their creations with the rest of the LiquidiD community. This company went beyond letting you invent your own perfect mixes, they’re also letting you release them into the Liquid iD community, for bragging rights, recognition or simply because you think everyone else will enjoy your unique concoction just as much as you have. Liquid iD wants vapers to look at it as something like your own virtual vape shop, where you can gain recognition for your accomplishments and work towards getting rewards, like free e-liquid. Visiting the Liquid iD website was quite a unique and very cool experience. I could simply click each flavor I thought would fit nicely together and make it into my own customized concoction. The experience made me feel like I was ordering more than just a mass-produced e-liquid – I felt in charge and the ability to customize my e-liquid to my own personal tastes was rejuvenating. Getting a bit trigger happy, I experimented by throwing many flavors together in each bottle. When finalizing the created flavor on MyLiquidiD, they’ve given me the opportunity to list who the e-liquid was made by. Being that my Wife decided to pitch in and create her own e-liquid with me, I placed her name as the mixologist on some, while others of course were by GuideToVaping. What makes this worthy enough to mention is that when you receive your created flavors, it will say “Mixed by:” at the top of the label on your bottle. 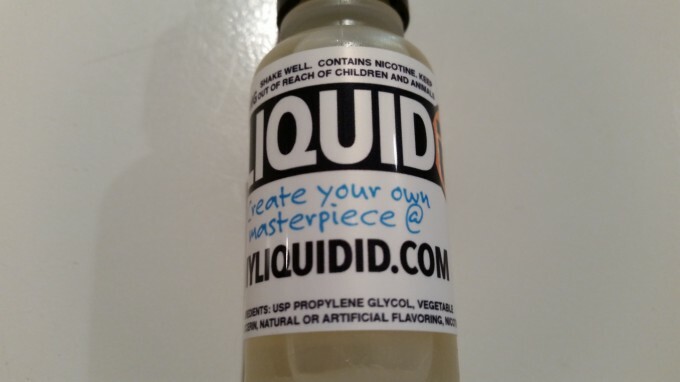 You can see our different super awesome creations on the MyLiquidiD website. To describe the label in addition with the picture below, you can see that the label contain the nicotine milligram level, a warning, the Liquid iD logo, the print “Create your own masterpiece @,” the website URL and at the bottom lists ingredients. 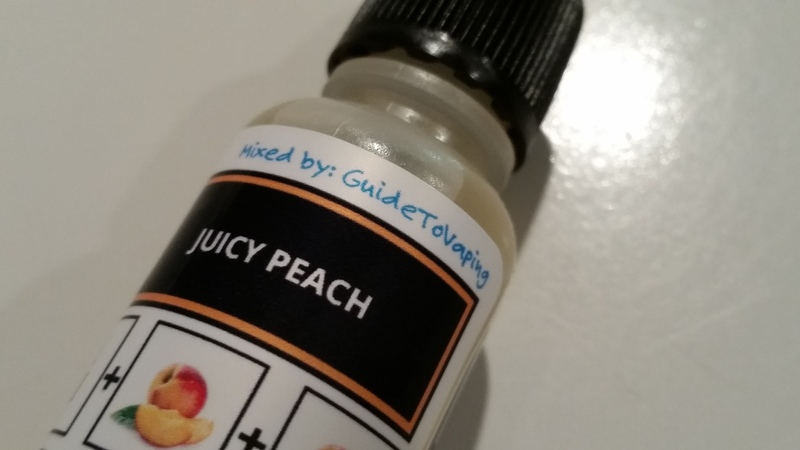 Located on the backside of the label is who the e-liquid was mixed by, the name of the e-liquid flavor, pictures of the different flavors used in the e-liquid to create the e-liquid and boosts added, if any. It can be said that the flavors are as good as the flavors I’ve mixed, but this isn’t totally true. What it comes down to first is how are the flavors individually, and then how was your mix that you, yourself made. Through my experience, the flavors are good and fit my taste buds perfectly. In other words, the flavors I’m getting from each individual flavor seems spot on or close and the quality is fine. As for the flavors my Wife and I created, we’ve enjoyed them all, well, except one that we experimented with. I guess that’s the fun of it, right? – You can see more about our experience with each flavor creation in our upcoming e-liquid reviews.